What do you get when you wire vintage magic eye vacuum tubes to modern analog and digital electronics? A unique device that combines sound, light, and motion. Join us for a brief lesson in vacuum tubes, colour organs, and how Rob was able to marry the two. This free Hackforge Tech Talk takes place Thursday, July 24th at 6PM. Hackforge is located in the front of the Windsor Public Library (850 Ouellette Ave, Windsor, ON). Check out our Meetup page for more information. 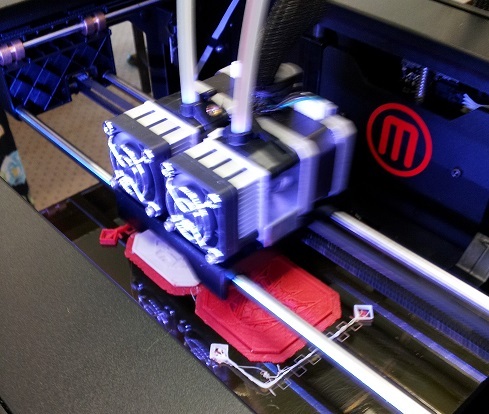 This Saturday, July 19th experience the power of 3D printing! Hackforge will be at Fontainebleau Library (3030 Rivard Avenue) for an afternoon of demonstrations. We will have a 3D printer on display so you can watch it create something from almost nothing. You can learn how to use a 3D printer to create toys, art, practical items, gifts, and much more. Kids and their families can stop by between 1-4PM on Saturday and see the machine at work, ask questions to Hackforge volunteers, and interact with 3D creations. This activity is most suited for ages 8-18. No registration required. Come see how you can bring items from your imagination to life with 3D printing this Saturday! This free event is part of Windsor Public Library’s summer Eureka programming.